With the increase in monetary penalties and permit sanctions for violations of any federal fisheries regulations, we strongly urge you to take seriously any interaction with law enforcement. False statements to, or interference with, state or federal officials may dramatically increase penalties or permit sanctions, and can even take a civil violation and make it CRIMINAL. False statements or misrepresentations can be considered criminal violations and will compound problems and are being heavily sanctioned. 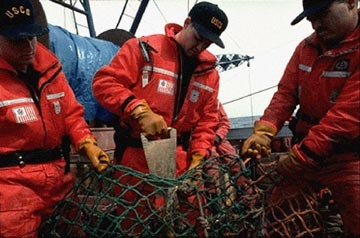 Remember, some states provide for criminal penalties for violations of their own fishery regulations. Statements to federal enforcement officials can, and probably will, be used against you in a court of law. At times it pays to decline to answer questions, rather than say the wrong thing. Preserve your right against self incrimination. When in doubt call your lawyer!!!!!!! 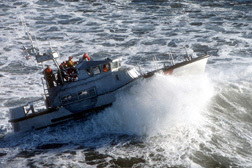 Although at times your relationship with Coast Guard personnel may be strained by their law enforcement role, remember that Coast Guardsmen put their lives on the line for you everyday!!!! Early intervention by your legal representative may reduce or prevent assessments of penalties or permit sanctions. Once assessed, penalties are difficult to reduce through the hearing process. Call your legal representative before a Notice of Violation and Assessment (NOVA) or Notice of Permit Sanction (NOPS) is issued. If you receive a NOVA or NOPS, make sure you immediately file a request for a hearing. When in doubt, call National Marine Fisheries Service, the United States Coast Guard or your state enforcement agency - keep a record of your call, along with the name of the person you speak to - it might save your permit.